Here’s some lingo you should know when booking an award flight using points or miles. These 25 booking terms can help you sort through the jargon like a pro. Advance purchase requirement: A limit on how close to departure you can purchase an award ticket. This only occurs on some airlines and most often with partner awards. Airport taxes: Taxes levied on award tickets based on the particular airports used in the award, including not only arrival and departure airports, but also layovers and stopovers. Changing the airports used in the itinerary can often lower its overall price. Award calendar: A manner of displaying the number of miles required for the itinerary required on different days of a week or month to allow the customer to choose departure dates based on price. Not available on all airlines. Booking class: A single-letter designation used by airlines to code the purchase price of a cash ticket and the limitations associated with that fare. When attempting to upgrade a cash ticket with miles, the number of miles required for an upgrade is often correlated to the booking class. Capacity controlled awards: Award prices rise according to demand on airlines with different possible award prices for the same city pairs. Carrier: Another term for airline frequently used within the industry. Carrier-imposed fees: On top of the airport and government taxes levied on all airline tickets, whether cash or awards, airlines often include additional fees on award tickets. These can include close-in booking fees and fuel surcharges, but they all fall under the umbrella of carrier-imposed fees. Class of service: The cabin of travel (i.e. economy, business, first). Code-share flight: A flight that is purchased through one airline but operated by and flown on an airplane belonging to another airline. Economy plus: A section of economy class with additional legroom that often includes priority boarding and priority security clearance with purchase. This is not a separate class of service, and on most airlines you cannot purchase these seats with miles. You usually have to pay a separate fee for this seating. Fare category: Like booking class, a single-letter designation used by airlines to code the purchase price of a cash ticket and the limitations associated with that fare. Fuel surcharges: A carrier-imposed fee added to award tickets that theoretically makes up for a difference in the fuel costs imposed on airlines at the time of booking versus when the award chart governing the mile requirements for a given award were initially devised. Also know as YQ charges, due to the way they are listed in the taxes and fees breakdown on award tickets. Miles and money: An option to purchase an award ticket with a combination of miles and money that takes the place of some of the typically required miles. The additional cash cost is on top of the usual taxes and fees. These tickets are often able to earn miles. They are offered under slightly different names on different airlines. Mixed-cabin: An award itinerary that includes different cabins or classes of service on the same ticket. This could be a mix of business class in one direction and economy on the return or a long-haul itinerary with first class for the main international flight and business class for the regional connections. Mixed-cabin itineraries often occur when using a mix of airlines that do not all offer the same number of cabin classes. 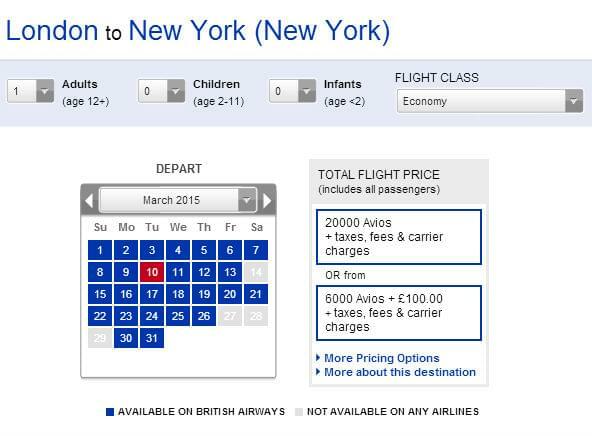 Mixed-carrier: An award itinerary that includes flights operated by different airlines. Multi-city: A ticket that includes more than two airports as destinations. This can include stopover, open-jaw, and round-the-world itineraries. Open-jaw: A multi-city ticket that includes flights that arrive at one airport and depart from another. Many airlines only allow open-jaws at each end of an itinerary, not on stopovers. For example, you could fly from New York to Amsterdam, stopping in London along the way, and return Paris to Boston, but not fly from New York to London, stopover, and then fly from Paris to Amsterdam and return Amsterdam to New York. Premium economy: Premium economy can have two very different meanings. Some airlines, particularly British carriers such as as Virgin Atlantic and British Airways, use the term premium economy in place of business for the class of service between economy and first class. Other airlines use the term for economy plus seating in the economy cabin. Premium cabin: A bucket term that includes all classes of service above economy. Redemption: The act of cashing in miles or points for an award. Segment: Each takeoff and landing on an itinerary. For example, a flight from Boston to Florence could include three segments: Boston to New York, New York to Rome, Rome to Florence. Taxes and fees: A bucket term for government- and airport-imposed taxes and carrier-imposed fees that make up the cash amount owed for an award ticket above and beyond the mile redemption. Two-cabin/three-cabin flight: Depending on the destination and size of the plane, airlines offer different numbers of cabins. A two-cabin flight includes only economy and one premium cabin, typically business class. A three-cabin flight includes economy, business, and first. Upgrade bidding: An option to use either cash or miles to pay less than the published price for a seat in business or first class by bidding against other passengers for an upgrade. Upper class: Upper class can be used in two different ways, either in place of “premium cabin” to designate any class of service above economy, or, specifically on some airlines like Virgin Atlantic, as the name for first class.